The eGo e-cigarette, originally developed by Joye/Janty and now manufactured by a variety of Chinese companies, is among the most popular of all e-cigarette models. No matter who your favorite e-cigarette vendor is, it’s likely that they carry some variation of the eGo. Some of the other names for the eGo e-cigarette include the Riva, the KGO, the Tornado and the Inferno. The two most common types of eGo e-cigarettes are the regular eGo — which includes an atomizer for cartridges or dripping — and the eGo-T, which includes removable tanks to feed liquid to the heating coil. The atomizer for the eGo-T is usually called a “tank atomizer” or “tankomizer.” If you buy the eGo e-cigarette, you are free to experiment with both liquid delivery systems as the battery is the same. The eGo uses the most common type of attachment threading, making it compatible with any e-cigarette atomizer or cartomizer designed for L88B, 510 or 306 e-cigarettes. The eGo e-cigarette is popular because it offers a good combination of flexibility, size and battery life. It works with all of the most common e-cigarette attachments, typically offers a battery capacity up to about 1000 mAh and has a relatively small size compared to other e-cigarettes with high battery capacities. The eGo also has the needed battery capacity to handle low-resistance atomizers, which simulate high-voltage e-cigarettes at lower voltage levels. Small e-cigarette batteries can’t use low-resistance atomizers without reliability problems. On the other hand, the size of the eGo may be a drawback if you’d prefer to have an e-cigarette that looks like a real cigarette. Some people are more comfortable switching from real cigarettes to an e-cigarette that looks and feels the same, which the eGo definitely does not. Also, the eGo is not available with an automatic battery that turns the heating coil on automatically when you inhale; you have to hold a button down each time you puff. The eGo-T tank system is an attempt to create an e-cigarette with the same convenience and low cost for refills as the older e-cigarettes with disposable cartridges while avoiding the leaking and poor vapor production inherent in cartridges. Each pack of refill tanks usually costs just a few dollars, and you can easily pop the bottom of a tank off and add more liquid when it is empty. The quantity of vapor that the eGo-T tank system creates is very close to what you would get from a standard atomizer with a hollow drip tip. On the other hand, an eGo-T tankomizer has about the same expected lifespan as a standard atomizer: about one month. After that, you’ll need to buy a replacement, and tankomizers usually cost at least $5.00 more than standard atomizers. In addition, because the heating coil is located at the bottom of the tankomizer and travels through a long plastic channel before reaching your mouth, you may find the vapor produced by an eGo-T to be less flavorful than what you would get with a cartomizer or standard atomizer and drip tip. However, it is important to remember that because all eGo batteries have the same threading, you can use any attachment you like with your eGo e-cigarette — so feel free to try everything. 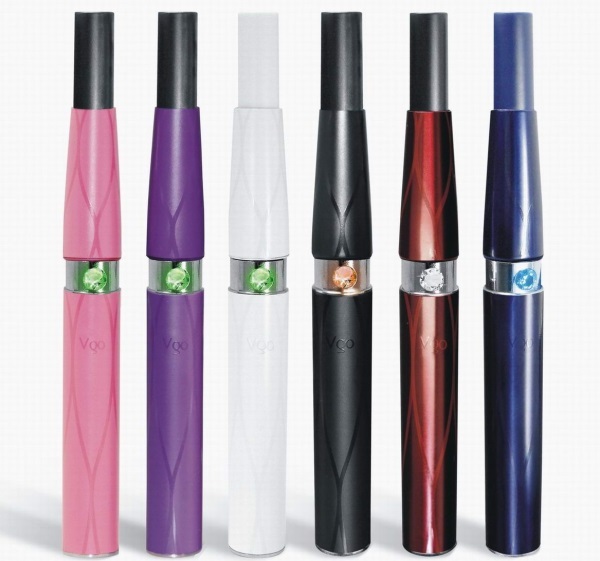 eGo e-cigarettes come in an enormous variety of colors. Just about every vendor offers an eGo e-cigarette kit, but I’ve had especially good experiences with NJOY and Halo. Both companies produce their e-liquids in the United States, so you can expect some really nice flavors regardless of the company you purchase from. Halo e-liquid has been available for many years, and it has a top-notch reputation. NJOY has also done some interesting things with e-liquid over the years, experimenting with additives such as citric acid to increase the throat hit — and overall satisfaction level — of its e-liquids. The NJOY Artist Collection is a great new line of sweeter e-liquids that I’ve really liked. These three eGo e-cigarette kits differ slightly in their included hardware. The Halo Triton has the benefit of being available in a wide variety of different colors, while the NJOY Convenience Vaping System is available only in black. The Convenience Vaping System also costs a lot less, starting at just $9.99 for a package that includes a battery, a pre-filled tank and an extra tank that you can fill yourself. 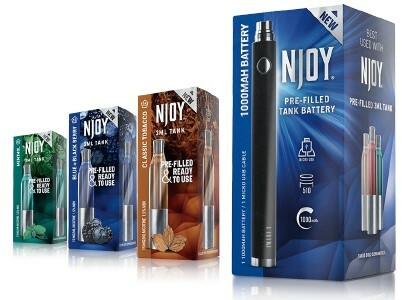 The pre-filled cartridges are a completely unique feature of the NJOY Convenience Vaping System; they taste great, last a long time and don’t cost a lot. NJOY Convenience Vaping System ($9.99 and up): Includes one battery, one pre-filled tank, one empty tank and USB charger. Ships free. 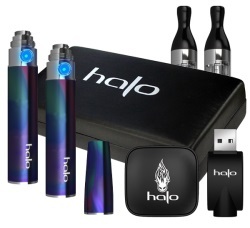 Halo Triton Kit ($47.45 with coupon code VAPE4LESS): Includes two batteries, two empty tanks, atomizer cone, USB and wall chargers. Now includes a free bottle of e-liquid! Available in 11 colors. This article was updated in June 2016. In a 2011 survey of 222 e-cigarette users conducted by the American Journal of Preventive Medicine, 70 percent of the respondents using e-cigarettes more than 20 times per day had completely stopped smoking tobacco cigarettes. E cigs are the best thing since pocket on a shirt I love them!!!! !